If it is difficult to imagine today the impact that Snow White and the Seven Dwarfs (1937, by David Hand) had in the United States at the end of the 1930s, it is even more difficult to consider the effects it had in Japan on occasion of its release in 1950. Indeed, Japanese artists realised in the same time the considerable possibilities of animation and their own technical delay. During the Second World War, Japan entered a period of austerity that limited access to entertainment. Paper was requisitioned and the importation of foreign works (especially Western movies) was completely banned. But in 1943, the Imperial ministry of Navy secretly violated its own directive and introduced Walt Disney Studios’ Fantasia (1940) to Mitsuo Seo 瀬尾光, a Japanese artist who directed several animated shorts films. The goal was clear: to produce animated films able to touch the young public while arousing a patriotic feeling. The 74 minutes film Momotarō Umi no Shinpei 神兵太郎海の神兵 (Momotaro God Warriors of the Sea, 1945) is considered as the first Japanese animated feature film. Yet, apart from the chauvinistic content, the animation is clumsy, not very innovative and obviously far from the proficiency of the Walt Disney Studios. “I have a great respect for Walt Disney. I consider him as the God of animation […] My desire to follow Walt Disney consistently grew during the war”. Tezuka’s enthusiasm was followed by many artists of his generation. After the abolition of the national ban, the attendance in movie theatres increased due to the democratisation of ticket prices. The public, for a long time deprived of entertainment, became easily receptive to novelty. Celtic, Germanic and European popular tales and legends were particularly appreciated. This phenomenon naturally boosted the success of the story of Snow White and the influence of this Disney feature is detectable in many animated films created in the second half of the Shōwa 昭和 period (1926-1989). Figure 1. 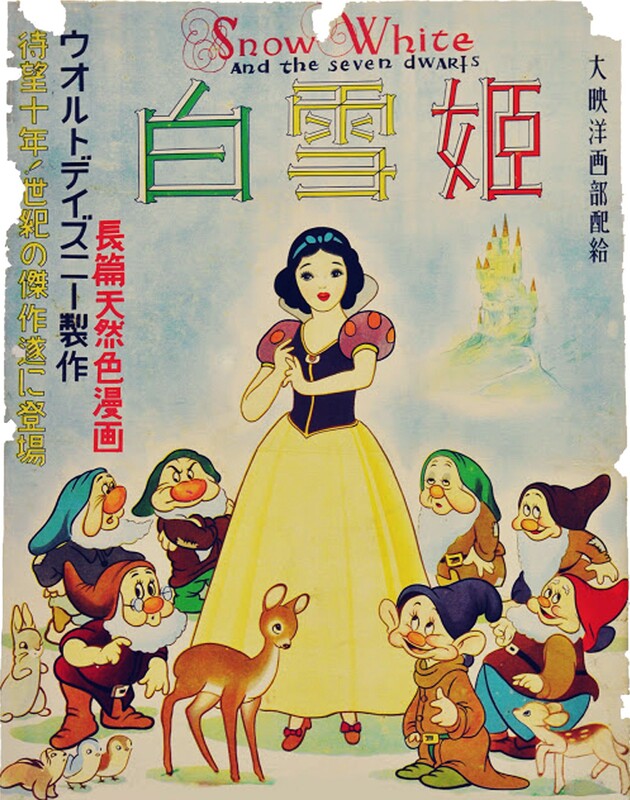 The original Japanese poster of Disney’s Snow White and the Seven Dwarfs. The first obvious trend is the effort of animators to reach naturalism. Characters with long floppy arms that look like rubbers and personified animals enrolled in allegorical fables became old-fashioned. Tezuka (also known for having produced the first “made for television series”) improved his animation style in several short films that show a technical innovation mainly inspired by Disney. 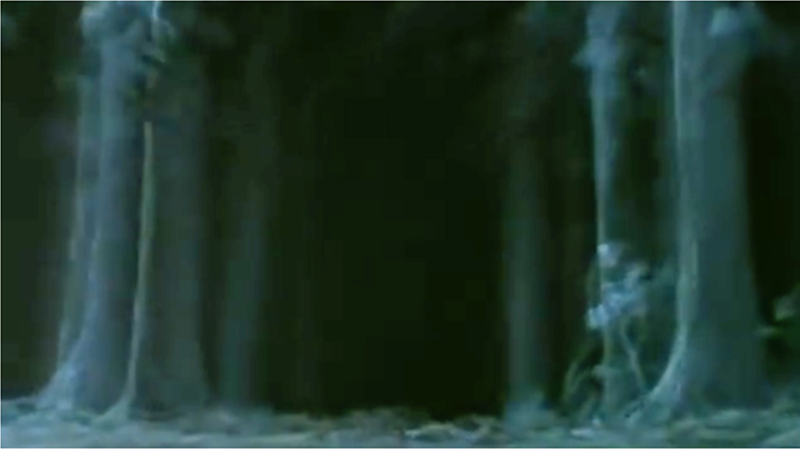 For example, the opening scene of Mori no densetsu 森の伝説 (The Legend of the Forest) present a simulation of depth that we can only obtain with a sophisticated multi-plane (see figures 2 and 3). The team members of the studio explain that they customised their animation stand to reach the same number of planes as the Disney operators. Figures 2 and 3. Two stills from Mori no Densetsu (The Legend of the Forest) by Osamu Tezuka. The famous artist Sadao Tsukioka 貞夫月岡, who worked at Toei animation studio on the first feature color films, still keeps contact prints obtained from fragments of filmstrip of Disney’s or Paul Grimault’s movies. His father, who was a projectionist, had provided them to help him to learn the art of animation by tracing characters frame by frame. It results a particular and recognisable rhythm, never seen in the Mitsuo Seo’s film that presented a sophisticated animation but whose basics were not controlled. In the 1950s, Japan produced several short films whose functions were close to those Disney imagined just before Snow White and the Seven Dwarfs in some of his short films. One of the most significant influences appears in the short film Kobito to Aomushi 小人と青虫 (The Dwarf and the Caterpillar), released in December 1950. The director, Hideo Furusawa 古沢日出夫, who had already made ecological fables, became, at the end of 1950s, animator at Toei animation studio. In The Dwarf and the Caterpillar, we easily find common motifs with Snow White and the Seven Dwarfs: a bountiful dwarf, helpful animals, a ubiquitous forest, and the sacred link between men and nature. The film deals with a hungry dwarf who meets a dying caterpillar. Depriving himself, he gives to the insect the only rice cake he has (see figure 4). Later, in the village, the inhabitants plan to designate their new sovereign with a vehicle race. When the dwarf runs for this role, the caterpillar, that has just become a powerful butterfly, harness the chariot and leads the gnome to victory. Figure 4. 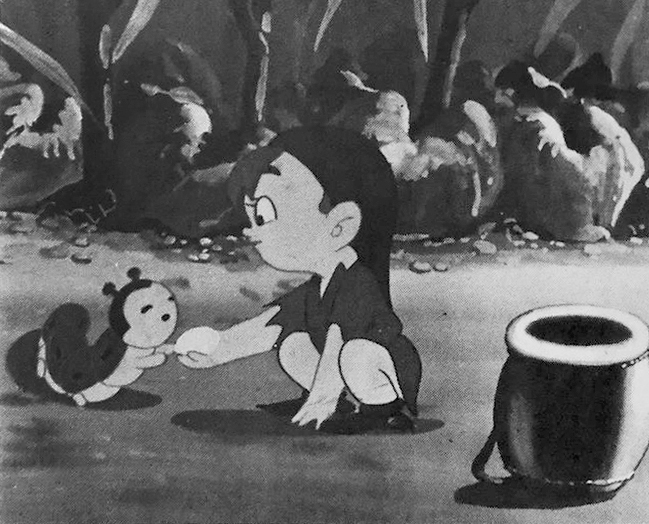 A still from Kobito to Aomushi (The Dwarf and the Caterpillar, 1950) by Hideo Furusawa. Unlike many concurrent productions, the story – written by Matuzaki Yoshito 松崎与志人 – doesn’t come from a traditional Japanese tale. Undoubtedly the film offered to Furusawa an occasion to experiment a new style of animation inspired by Disney. In the first twenty years of Japanese animation, the bestiary looked inherited from the medieval painted scrolls emaki 絵巻 that represent anthropomorphic rabbits, frogs or monkeys bathing and getting ready for a ceremony. Yet, these animals generally symbolised human grades. When, in the post-censorship period, they became more naturalistic, their design, their animation and their function in the story clearly evolved under the impulse of Disney to become the “signature look” of the Occidentalism trend until the end of the 1970s. Samuel Kaczorowski is a French researcher in animation, director of animated films, associate professor of Applied Art affiliated to Tokyo Hosei (Japan) and Toulouse 2 Jean-Jaurès (France) Universities. His thesis – that he started in 2009 under the status of guest researcher at Hosei University and supported in 2014 – was published in 2017 under the title Capter le moment fuyant – Osamu Tezuka et l’invention de l’animation télévisée (Catching the shifty moment – Osamu Tezuka and the invention of made-for-television animation – Ed. L’Harmattan). To observe the way the Japanese filmmakers remodelled the whole animation process to create a “made-for-television” style, Samuel Kaczorowski investigated in many studios in Japan (Mushi productions, Satelight, Ankama, Ghibli, etc.). Today, his activities, shared between research and practice, are focusing on the depth in cel-animation, the creation of a common field between animation, motion design and graphism, and the historiography of animation via the technical approach. Osamu Tezuka, Boku no manga jinsei ぼくのマンガ人生 (My life of manga), Tōkyō, Éd. Imawani Stoten 岩波書店, 1997, p. 50, my translation. He worked as an in-betweener on Arabian Nights: Sindbad no Bōken アラビアンナイトシンドバッドの冒険 (Arabian Nights Sinbad’s Adventures), for example. It is the case of Babes in the Woods (1932) or The Goddess of Spring (1934). Produced by Sanae Yamamoto, Tōkyō – animated film, Black&white (17 min), released in Japan in December 1950. Chōjū-jinbutsu-giga 鳥獣人物戯画 (literally “Animal-person Caricatures”). 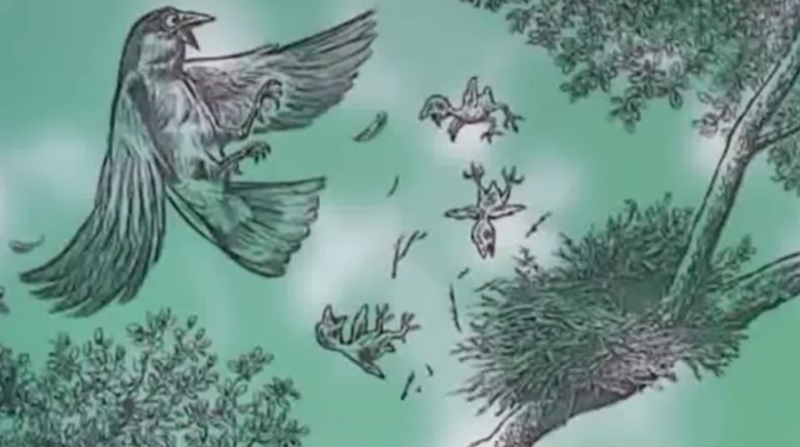 In the animation during the war, animals are often metaphors of people or moral values (e.g. pigs often designate Chinese soldiers, dogs incarnate Japanese servicemen, monkeys represent someone malicious, and so on). From this period, even when Japanese filmmakers adapted local tales, we often see groups of animals following the main character in a vibrant farandole – like in all Toei’s feature films on which Furusawa worked or like in Hakuja-den 白蛇伝 (The White Snake) by Hideyuki Takahashi, Kôichi Akagawa, Sanae Yamamoto, Tōkyō, Toei Dōga Prod. – animated film, stereo sound, Eastman Color (78 min), released in Japan in November 1958. You conveniently omit to mention that the “clumsy” Momotaro film is what inspired Tezuka to do animation in the first place. Perhaps because the fact that such a film could have moved him to tears and prompted him to enter the industry despite having viewed early American cartoons goes against your narrative of Walt Disney being so superior to wartime Japanimation. You bring up Mori no densetsu, but how do Tezuka’s other shorts fit in your narrative? It looks like you are ignoring the contextual elements that don’t fit snugly into the picture you want to see, at least this is how it seems from the reader’s viewpoint. Don’t overstate the influence of Disney on Japanese animation, it is short sighted. Finally, there are many, many early Japanese animation films that do not feature animal characters, so while I don’t disagree with your thesis it is not very convincing. You say that the use of animal characters mostly occurs in the “first twenty years” of Japanese animation, but your footnote references wartime animation. Are you not aware that Japanese animation started in the 1910s? While some early (10s and maybe early 20s) animation looks similar to emaki, later on it is clear that several films were influenced by US animation in their use of animal characters. I don’t think the emaki aesthetic even lasted 20 years. Momotaro was not what inspired Tezuka to do animation in the first place. Your comment is anachronistic if you say “first” about the timeline, and false if you take attention to a scale of importance. Disney’s movies were seen and admired by Tezuka before and in a stronger way than the Mitsuo Seo’s (see the Tezuka’s circumstantial declarations in ぼくのマンガ人生). Then, about the impact of Disney in the Tezuka’s other short films, it’s a long chapter that can be observed at different levels (character design, screenwriting, technical and visual aspects…). It mobilizes a lot of criticism and analysis (needless to mention them here). I know it is fashionable nowadays to say that Japanese animation is 100 years old: it is true if we retain the first isolated expressions, but I talk about federated and organized animation industry. About this point, I prefer to quote Hayao Miyazaki (in an interview at Ghibli in August 2010): “In Japan, we use to say that all arts has a lifetime of fifty years. Yet, Japan produces animated films for about fifty years”. Finally, I agree when you suggest that Disney’s influence should be downplayed or put into perspective regarding the Historical aspect. In absolute terms, it should be done to avoid biased vision, but this is not the topic of this call for contributions. Thank you for this great article! I also think that the Tezuka´s declaration of love for Momotaro came late, in a bizare context of rehabilitation of Japanese culture. To be honest, after the war, all Japanese artists looked towards Disney, I could not name a single filmmaker who is an exception. Each time Tezuka´s works are evoked, it is to report the influence of Disney (how much Astro boy looks like Mickey Mouse, the plagiarized Bambi and Pinocchio, etc.). Here, by focusing on technical aspects (multiplane), this article brings something new and explores, in addition, some bad-known works and artists. Thanks!